Old Fashioned Tuna Macaroni Salad seemed just the thing. It’s great for a cool summer lunch and just a fun dish to tote along to a potluck or barbecue. And just because it’s old-fashioned and dirt cheap to make, doesn’t mean it can’t be absolutely fabulous!! I love this salad even though it’s slipped my mind for a few decades, lol! Sometimes I think I’m always chasing the new recipe or the fun trend and then when I get back to my small town roots, it’s like coming home again. 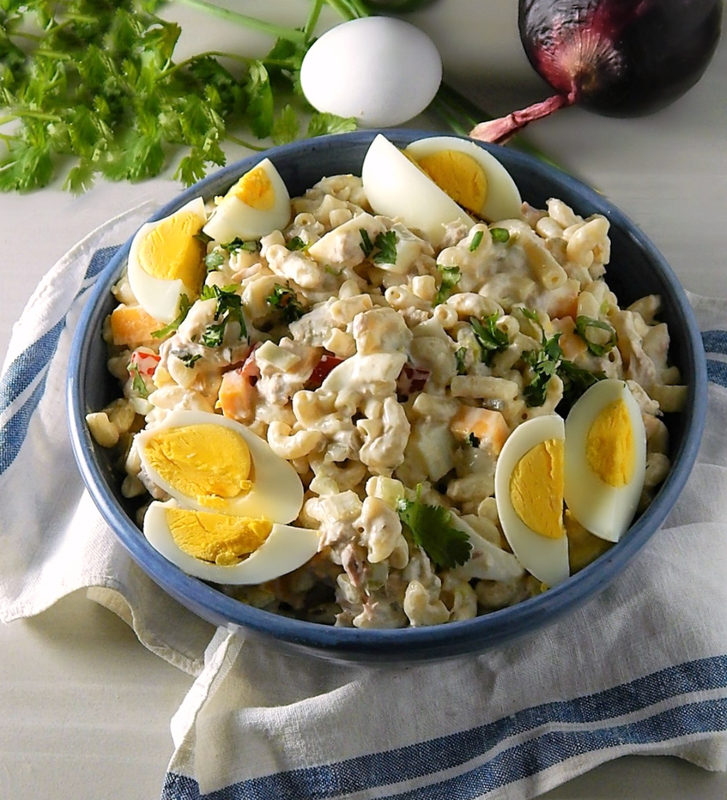 I was surprised to find out there’s a little write up on Wise Geek about Macaroni Salad. At it’s most basic, the salad is small macaroni with a dressing (and I love mine with the touch of vinegar and dry mustard powder, one of my Top Secret Super Stealth Arsenal of Ingredients) a little celery and tuna, but it can be changed up in so many ways. My fave mix up is the above along with a little finely diced red onion, green onion and red pepper, hard-boiled eggs (see it’s really a meal!) and little cubes of cheddar cheese. Traditionally, this is made with sweet pickle relish but feel free to add dill pickle relish, olives or capers. Anything with a little tang, really. If you’re feeling it, a teaspoon of garlic and/or onion powder can jazz the creamy dressing up. A lot of recipes have peas, too. Not necessarily my thing, but add them if you want. So make this Old Fashioned Tuna Macaroni Salad and make it your own. Heck if you don’t like tuna, it’s good without, too. There are just a couple hints to make the best Tuna Macaroni Salad. The noodles should be cooked just al dente, so they have a great bite. You have to add more dressing than you’ll think you need, though, because those al dente noodles are prone to absorbing some of the moisture, which can leave your salad on the dry side after it’s chilled. And you do want to chill this salad before you serve it. It’s always just a bit of a variable as to how much moisture is going to be needed, but there’s a solution. Mix the salad up but don’t add any garnish yet. Chill it down and when you remove it to serve it, if it is just too thick and no longer creamy, add a little water. I know – you’re probably like whaaaat? Trust me on this one, add a tablespoon or two, or maybe a 1/4 cup or more, give it a stir to restore that salad to all its glory, then garnish and serve. Other than that, dice your veggies finely just for the aesthetics, and add as few or as many as you’d like, and add just what you like and enjoy! You’d be hard-pressed to find a salad for a potluck (or home) that comes in at such a budget price for such great taste and flavor. All the ingredients are some of the least expensive ingredients you’ll find so why not go a little overboard on them and make this the most decadent Old Fashioned Tuna Macaroni Salad you can? If you do need to save a little bank on the Old Fashioned Tuna Macaroni Salad, stick with the basic celery, choose green pepper (sometimes 1/2 the price of the colored varieties) and red onion. One can of tuna will get you by, too. Eggs are so inexpensive, they’re always a great way to up the protein w/o a lot of expense so don’t skimp on them. My store stopped doubling coupons awhile back so I just don’t use them like I used to. I do tend to buy pasta and other basic items still with coupons, stocking up when they’re on sale. Pasta like macaroni generally doubles when cooked, and 8 ounces dry is about 2 cups, so it yields 4 cups cooked. Like any ingredient containing flour, I bring it home and toss it in the freezer for 3 days. That eliminates the possibility of any pests. This is the BEST Old Fashioned Tuna Macaroni Salad made just how you want it. Hard-boiled eggs optional. In a large bowl, mix together the cooked macaroni, diced vegetables, red and green onions, set aside. In a smaller bowl, mix the mayonnaise, pickle relish, vinegar, dry mustard powder, salt, pepper and pinch of cayenne. Toss the dressing with the macaroni mixture. Fold in tuna, cheese, peas and diced hard-boiled eggs. Refrigerate and garnish with the additional eggs, parsley, cilantro or sliced green onion before serving. When making macaroni salad, it may become stiffer and the macaroni may absorb too much of the dressing after it is refrigerated. To restore, add water in small increments, a tablespoon or two at a time until salad is creamy and desired consistency. Then garnish and serve. This entry was posted in Click here for Fabulous Food Posts and tagged Bell Peppers, cheddar, Cheese, Eggs, Fish and Seafood, Green Onion, hard-boiled eggs, hearty sides, macaroni, Main dish salad, Mayonnaise, Pasta, pasta salad, Peas, Red onion, Salad, Side, Tuna. Bookmark the permalink. Totally making this before the week is over. Thanks! It’s such a perfect hot weather salad. Cool and hearty at the same time. I love tuna salad, egg salad and macaroni salad, but I have never thought of combining the three. Your photos are screaming my name and I think the right time has come to try this kind of salad. Thanks for sharing, Mollie. Happy Fiesta Friday! It’s just me and hubby and he won’t eat pasta salads, but I couldn’t resist making this for myself! I made a half recipe and it was (is) fantastic! Thanks so much for posting the recipe. Hi Stella, I’m glad you enjoyed it!! I am glad you halved it! I was hard pressed to finish it off, but lluckily my son stopped by and “helped” out. Thanks for stopping back and commenting! This one is a winner, love the recipe!! It’s an old standby here in the miidwestern states! Yum! That’s a dish from childhood, for sure. Alas, I don’t eat pasta these days (or if I do, a very tiny portion that I enjoy greatly), but this definitely has a special place in my heart and on my patio party menu. I try to limit the pasta bread and rice but you probably wouldn’t know it from my recent posts! Luckily my son was over and ate about three quarters of it just by himself – I had forgotten what a huge bowl it makes! I don’t know why I never thought to stir in some WATER when a macaroni salad tightens up. I have always added MAYO but your technique is brilliant. Thank you. Well Thank you…I’m feeling pretty darned smart now,lol! More mayo sometimes is just too much!